The transceiver is designed for short range communications and has a transmitting range of approximately 1 mile; however, by carefully selecting a transmission site, the transmitters range can be extended to as much as 4 miles. The Type 883 has several limitations. The major problem with this transceiver is that it lacks internal calibration. With out internal calibration it is impossible for the operator to accurately determine if the actual frequency on which the transceiver is operating matches the reading on the frequency dial. In addition, organisational maintenance on the type 883 is difficult because the parts are soldered to the chassis instead of the plug in type. The set is also very susceptible to electronic warfare due to its narrow frequency range.. Also the transceiver is unbalanced and awkward to carry because the battery compartment is attached to one side of the case. The 883 however can be netted with the AN/PRC 25, AN/PRC 77, AN/PRR 9, AN/PRT-4A and the AN/VRC 12 family of radios. The set was considered obsolete in 1975 and was being replaced by newer man-pack radios. The complete set consists of the transceiver, an accessory bag, the antenna, the microphone and headset and an accessory box. While I have the radio, the headset and microphone and antenna, I have never seen the accessory box or bag so can not comment on what it contained. The picture of the accessory box would indicate tools and spare fuse. 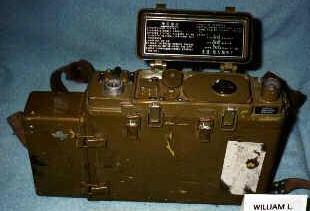 This radio was designed to provide communication between platoon, company and battalion levels. As such it is comparable in role to the AN/PRC 25 and 77 sets. It is not the best set for use by a force conducting guerrilla warfare, which is probably why it was never seen in Vietnam prior to 1968. It must be assume that these sets were issued to the NVA in time for their 1972 offensive and for the final assault in 1975. Presumably these sets were recovered by US forces after the 1972 offensive and were discussed in a 1975 Technical Intelligence bulletin prepared by the 11th Military Intelligence Company. By the time these radios entered the conflict, the U.S. effort in Vietnam was winding down, the technical intelligence effort had departed and there was the possibility that some of these sets came home with GI's as war relics means that they are more likely to be encountered than some of the older sets. The collector values of these sets depends on how badly you want the set and how complete the set is. Obviously the more complete the set, the higher the value.